I have always been a film nut. When I was growing up I had only one other friend who could spout all the dialogue from films like I could. 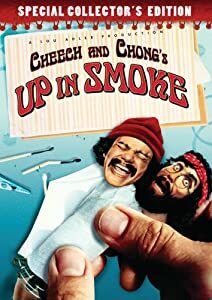 This same friend and I would ‘re-enact’ all the scenes from Cheech and Chong’s Up in Smoke, much to the disgust of our workmates. I still don’t know if he was being sarcastic or not. After a while you start talking less about the films you love. Of course these days you can talk about movies as much as you like via YouTube or in a blog. Pausing only long enough to edit both mediums and upload them on the computer. It is a lot easier now to be a film fan who ‘runs off at the mouth.” That was not always the case. In 1985 just after I’d married my second wife, I got sent to Germany for a conference. My first night there I met a young, pretty, female airman who was a fellow movie nut. We spent the first night, alone in the crowd, talking almost non-stop about movies we loved. We also talked about films that the other person had not seen and traded notes as it were. She then made an oblique reference to a Marx Brothers film. I could not believe that I had met another Marx Brother’s fan. We then talked and recited Groucho and Chico lines to each other. We only took breaks from this activity to replenish our beer supply and potty breaks. She then did the entire courtroom sequence from Duck Soup. 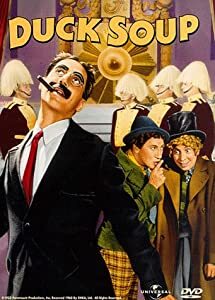 After I had stopped laughing, I took a deep breath and said jokingly, “Where have you been all my life.” And before I could do a Groucho eyebrow wiggle, she turned. Her eyes went cold and icy. “What did you just say?” Before I could repeat it, she stood up and grabbed her beer. “You are married!” With a derisive snort, she turned her back to me and marched off. You could have knocked me off my chair with a feather. Where had that come from? Marx Brothers fan she might be, she didn’t necessarily have a reciprocal sense of humour. She ignored me for the rest of the week. I talked about it to her male friend who came to the conference with her. It turns out that her husband had been fooling around with another woman. She, quite understandably, was not very trusting of other married men. On reflection I can see how she reached the instantaneous conclusion that I was ‘coming on’ to her. She had mistaken my joke for an invitation. I, in turn, misread her love for movies. I thought that anyone who was a Marx Brothers fan would get my attempt at humour. She then missed my also attempted explanation. So not quite ships that pass in the night. Still it would have been nice to know just one other film fan to talk to. Now I have my daughter and we both hinge our tongues in the middle and let them flap non-stop while we talk about movies.